London, 2017. Except… it isn’t. Berlin, 1961. But it isn’t that, either. Not really. Not in the timeline the Doctor knows. Something is very wrong. While Ace tries to save the life of a wounded British spy in East Berlin, Mel and the Doctor must get to grips with the modern-day socialist Republic of Mokoshia. For Mel, it feels strangely familiar and ‘right’, which makes the Doctor feel even more uneasy. Soon, a message from a dark and blood-soaked distant future is on its way… But the Doctor will have to act fast to stop this timeline becoming reality. And with Ace stranded in an alternate 1961, will saving the Earth end her existence…? Germany? Alternate history? Is this a Steve Lyons story? Perhaps I’m being unfair, but the first comparison that sprang to mind when I started listening to this audio drama was to that writer’s Colditz and the Klein character it spawned (who will be back in a couple of months’ time, by the way). Actually, the Seventh Doctor (Sylvester McCoy) and Ace (Sophie Aldred) do have something of a knack for taking on Eastern European foes, in the present, past and parallel timelines, having faced Nazis in Silver Nemesis, Illegal Alien and Timewyrm: Exodus. The reason they go so well together is probably because such adversaries provide a good foil for the Seventh Doctor’s own brand of ruthlessness and Ace’s outspoken abhorrence of such regimes. However, forget about Nazis. This time the TARDIS travellers are up against the Soviet Union, which controlled East Germany from 1949 to 1990, erected the Berlin Wall in 1961, and also appears to be in charge of Britain in an alternate 2017. Incidentally, the use of 2017 as the ‘present day’ setting of this story is not an indication that it was written and recorded in that year (though in fact it was), but a deliberate choice on the part of writer Una McCormack (not Steve Lyons at all), being the centenary of the Russian Revolution. 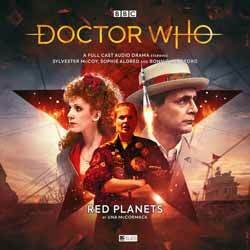 As well as London in 2017 (where the Doctor and Bonnie Langford’s Mel spend most of their time), McCormack weaves plot threads set in 1961 Berlin (where Ace is) and on Mars, where a Russian mission has just touched down. This means that, when the Doctor and Mel get split up, there are up to four story strands unfolding at any one time, which really helps to keep the listeners riveted. No disrespect to the TARDIS crew, but the Martian scenes are among the most effective (though what Ace is confronted by at the end of Part Two is also pretty jaw-dropping). The tense radio communications to and from the cosmonaut Chaika (Genevieve Gaunt), who describes something inexplicable on the surface of the planet, make ideal material for an audio drama. The Mars scenes are also the most mysterious, in that it took me the longest time to understand their connection to the overall plot. The writer keeps us guessing for longer than might be expected. Usually with a four-part serial format, the audience is given at least some of the answers during the second or third episode, but Red Planets doesn’t give up its secrets until some way into Part Four. It’s probably just as well, as the explanation behind the Martian situation does feel a bit contrived when it is finally revealed. However, the journey up to this point is consistently entertaining, rather than frustrating, thanks to the intriguing natures of all three locations, strong performances by the cast and stirring music from Joe Kraemer. The latter combines Russian military might with sombre classical tones, and a few nods to Mark Ayres’ score for The Curse of Fenric (which, of course, also featured Russkies) along the way. The six-minute medley of isolated music at the end of Disc One is well worth a listen. Among the guest cast, Elliot Levey as Colonel Marsden has the disadvantage of occasionally sounding too similar to McCoy during his gruffer moments, but his comrade Genevieve Gaunt doubles up well as both the Russian Chaika and the English Anna. Meanwhile, after a couple of months of awkward adjustment, the design department has adapted to the wider canvas imposed by the new series logo, and artist Simon Holub provides a strong front-cover image. Overall, the mission may be considered a success for the glorious Big Finish Union.